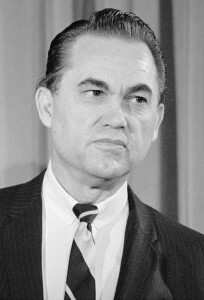 Wallace was elected Alabama’s governor in 1962 largely on his pledge to maintain racial segregation in his state. He served four terms, during which he became a national symbol of southern racism during the Civil Rights movement. In 1968, he ran for president on the American Independent Party ticket, and in 1972, while campaigning for the Democratic presidential nomination, he was shot and paralyzed below the waist. In the 1980s, Wallace not only renounced segregation, but sought reconciliation with the black community.